A rare picture of a 'Baby', a six-ton adult male belonging to the Grampian herd. 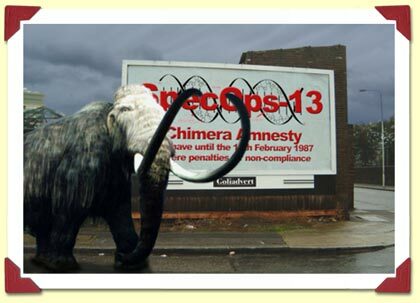 He is shown here taking a short-cut through the industrial area of Swindon and photographed just in front of a SpecOps-13 poster announcing the last Chimera Amnesty. One of three known mammoth incursions, Swindon rarely has the same sort of trouble as Devizes - but both lie on the mammoth migration route. He was reunited with his colleagues the day after this picture was taken. August 1988.